The recipe for a successful Fringe production tends to be the following: a splash of notoriety with a dash of hype combined with a sprinkle of shtick. And the team behind The Bardy Bunch took this completely to heart. 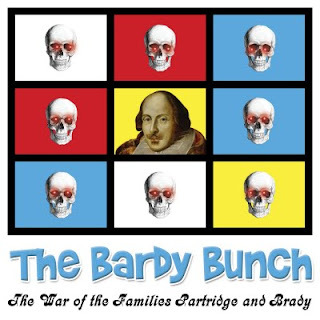 They had a splash of notoriety (the classic sitcoms The Brady Bunch and The Partridge Family), a dash of hype (and ensemble of 18 singing and dancing comic geniuses), and a sprinkle of shtick (The Bradys and Patridges battling in a war of words straight from the Bard himself). If you’re looking for a surefire laugh, look no further than The Bard Bunch: The War of the Families Partridge and Brady. I like to consider myself a professor of Pop Culture. Sure I lack the PhD, but I know my classic sitcoms. And believe me, there was not a single joke or reference I missed. I can’t say that I’ve seen every single episode of the musical family clans’ shows, but I’m pretty well versed. If you want to take away my theater degree go ahead because I have to admit, I probably know more about the Bradys and Partridges than I do of the work of William Shakespeare. Yet I was laughing from Prologue to final song. If you’re a fan of either show, you’re appreciate the lack of original music because you’ll know every song used. And you’re allowed to break out into laughter the moment the six Brady kids start “Keep On, Keep On Dancing,” choreography included. Though you forgive the weak and pigeonholed script, the show is all about laughing and poking fun at the families you grew up with, either in the 70s or on TV Land. And then there’s the Shakespeare aspect of the show. Throw in some of the Bard’s classic lines and plots into the Brady and Partridge world, you would think Willy envisioned the future. As I continue, just remember what happens in most of Shakespeare’s tragedies. Death. And The Bardy Bunch was a hilarious bloodbath. Though I may sound like I’m spoiling the plot, there’s no surprise there’s a Hamlet-esque finale. If you gave a producer a script with an ensemble of 18 nowadays, they would probably laugh in your face and hand it immediately back. But when you’re going to do a parody of these two families, you can’t do it with any less. Each member of the cast had their moment to shine, though the adults were completely outshined by the eleven "children". The kids of the two clans emulated their famous counterparts perfectly. I would be here forever if I wrote about all eleven of them. But I will say they used their spotlight moments perfectly. Fine, I lied. I’ll boast a few of them. Talisa Friedman had Cindy Brady’s lisp down to a T. And she used it all the way through her hilarious Polonius death and reemergence as ghost Cindy. Olli Haaskivi was the epitome of dastardly, giving the usually forgettable Chris Partridge quite a character. A.J. Shivley, though more attractive than Barry Williams ever was, found his inner elder Brady with charm and charisma. Elizabeth Wharton’s deadpan Tracy Partridge was borderline scene stealing with all of her deliveries. And it wasn’t until Jonathan Grunert got his moment to shine that Peter Brady existed in the play. And of course it was “Time to Change”, Peter Brady’s classic song now turned into a power ballad of sorts, that stopped the show. But there were really two standouts. One Brady and one Partridge. You could not have found a more perfect actress to play Jan, the middle daughter, than Annie Watkins. If you’re familiar with The Brady Bunch movies of the 90s, you’ll remember the riotous Jennifer Elise Cox’s take on Jan. Watkins took Cox’s Jan and brought even more hilarity to her. Even when she was dead, Watkin’s Jan couldn’t catch a break. Erik Keiser as Keith Partridge was sheer perfection and the standout of the bunch. As he lusted after Marcia, Keiser was suave and commanded the stage. Like David Cassidy was the star of The Partridge Family, Erik Keiser was the star of The Bardy Bunch. Look out for what this kid does next. The biggest question of this century has been who’s team are you on: Team Edward or Team Jacob. I personally don’t care. I’m still reeling trying to figure out if I’m Team Brady or Team Partridge. The Bardy Bunch is a campy laughfest that you’ll be sure to love.